OK, I admit it, I’m a holiday junkie. I’ve even got a new nickname: Captain Christmas. Friends and family members just roll their eyes and shake their heads, when the calendar page flips from October to November, because they know what it means: Every free moment from that point onward is devoted to decorating the house ... first outside (gotta make it by Thanksgiving weekend!) and then inside. Naturally, the proper mood must be set for such activities, and nothing keeps my spirits raised — particularly as I approach the conclusion of an all-day session — better than a toe-tapping, finger-snapping collection of Christmas jazz. Having now been accumulating such albums for the better part of a quarter-century, I must have one of the best collections in the country ... with no end in sight. Although mainstream labels have decreased their new releases during recent years, the flow has remained constant, thanks to Web sources such as cdbaby and www.ejazzlines.com. Both are excellent sites, and the latter even has a section devoted to holiday jazz. One must apply a bit of caveat emptor to cdbaby, though; since the site stocks and sells pretty much everything submitted, one can bring home an eye-opening grade of trash. Fortunately, I’m here to help spare the pain. Yes, I listen to the bad ones, just so you won’t wind up with a nasty surprise. While 2007 has not been a banner year for new arrivals — very few must-have stand-outs — most of the albums cited below would rate a solid B on the standard grading scale. That still makes them eminently listenable, and therefore worth your time. Searching for cool new sounds is a full-time endeavor, and the Christmas jazz sub-genre is no different. As always, several titles came to my attention just after I published last year’s edition of this annual round-up, so I’ll start with those. Credit for calling this first album to my attention goes to Shaunna Morrison Machosky, music director at the Pittsburgh-based National Public Radio station WDUQ, who in late 2006 published her list of “the best holiday jazz CDs.” She resisted adding the word “ever” to that title, but since her compilation includes Nat King Cole’s The Christmas Song and Ella Fitzgerald’s Wishes You a Swingin’ Christmas, her taste obviously is impressively wide-ranging. Machosky’s list concluded with Diane Delin’s Offerings for a Peaceable Season (Blujazz BJ3351), and I was drawn to it by virtue of Delin’s instrument of choice: the violin. Jazz violin, I hear you cry? Indeed. This tasty little album proves that strings can swing, particularly when accompanied by solid support from a piano-bass-percussion trio. The tone is mostly quiet and contemplative, with several tracks — notably “My Favorite Things” and “Winter Wonderland” — demonstrating a gentle, Latin-hued samba beat that serves as ample foundation for Delin’s sassy violin chops. I also like her program choice; she goes for lesser-known carols such as the traditional “Gloucestershire Wassail,” Victor Herbert’s “Toyland” and a lively bop version of the overture to Tchaikovsky’s “Nutcracker Suite” (rapidly becoming a holiday staple). 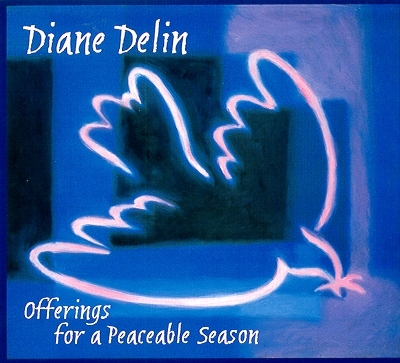 Delin’s handling of “Deck the Halls,” with its piano and bass underscore, reminds me of Duke Pearson’s classic arrangement of “Sleigh Ride”; the result is impossible to resist. She’s also a generous leader; an exquisitely pretty reading of “Petit Papa Noel” grants a full three minutes to pianist Dennis Luxion and bassist Eric Hochberg, before Delin’s violin finally weighs in. She brings the set to a lively conclusion with her own up-tempo reading of “Sleigh Ride,” and I immediately wanted to listen to the entire album again. So will you.